Nep Sidhu says he hasn’t slept in three years. That’s when he and curator Cheyanne Turions began working together on Medicine For A Nightmare (they called, we responded) at Mercer Union, Sidhu’s first solo exhibition in Toronto. The Scarborough artist spent an entire year making one of his intricate tapestries in his Malvern studio and his “mobile studio” in New Delhi. For other pieces, he spent hundreds of hours engraving metal amulets and pendants that adorn what he refers to as “medicine hats” and carefully embroidering motifs of swords and sound waves onto muslin. ...Medicine For A Nightmare focuses on Sikh culture, tradition, preservation and how memories are inherited and passed along. 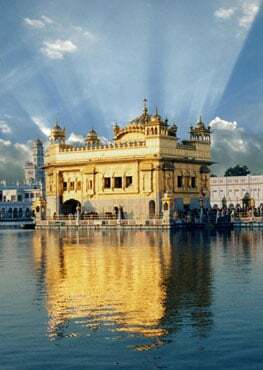 These themes are explored in the context of the 1984 massacre of thousands of Sikh people in India, known as the military-led Operation Blue Star. For example, the exhibition’s showstopper, a 220-inch-by-108-inch tapestry from the series When My Drums Come Knocking They Watch, references the 1984 attack of the Sikh holy site the Golden Temple in Amritsar, Punjab, and the resilience of Sikh communities. Surrounded by a patchwork of embroidery and paint, the tapestry depicts two men about to enter the Golden Temple, curtains drawn back as if inviting the viewer into the space. Swaths of jagged waves and embroidered swords – a reference to the strength of Sikh steel – fill the tapestry, while black hair weaved into jute macramé hangs from the bottom. ...To preserve that history, he’s engraved it into an impermeable material: steel. He explains how Sikh metallurgy has its roots in Rwanda, whose people then gifted that knowledge to Sri Lanka, which then transferred to Punjab. “The arrows on the amulet represent the Chera dynasty of Sri Lanka, the blade for Rwanda and the symbol Ik Onkar, which means one supreme reality,” says Sidhu.